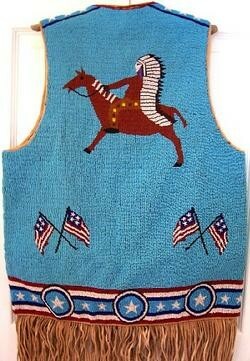 Here is a beautiful 1920s fully beaded Pictorial Vest front and back with crossed American flags, Indian Chiefs on horseback front and back, with full War Bonnets, Stars from the Pineridge Reservation South Dakota. Size Large. More pictures available by request. 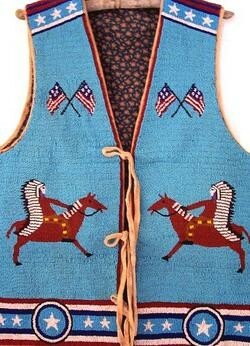 Here is a beautiful 1920s fully beaded Pictorial Vest front and back with crossed American flags, Indian Chiefs on horseback front and back, with full War Bonnets, Stars from the Pineridge Reservation South Dakota. Size Large. More pictures available by request. Please email cowboycabin@centurytel.net with questions or call 406 270-2842.